What if we could find something that tasted like sugar- but without the toxic effects to our bodies of fructose? How much would that change our lives? All our experiments this year have been moving in that general direction: not only are we weaning ourselves down from a taste for sweetness on the one hand, but we’ve been working on sweet alternatives on the other. Ideally, happiness and healthiness meet somewhere in the middle, get married, and live happily ever after. Thus our many experiments with banana and date sweetened cookies, banana and coconut pancakes, and most recently yogurt and banana popsicles. Recently, however, I’ve begun to wonder just how many bananas a person could reasonably eat. Also, I’m getting a little tired of all my cookies— carob chip, peanut butter, raisin— all tasting pretty much like bananas and dates. So imagine my surprise when my husband Steve came home a few weeks ago with a (get ready) chocolate bar!! Gasp! Avert thine eyes! But no! he says, we can eat this. Huh? I thought I had seen it all in my desperation to comb the internet for sweet substitutes that our Year of No Sugar would accommodate. I have yet to try brown rice syrup, but other than that we haven’t found much beyond cutting up fruit, putting it into our recipes and hoping the other ingredients don’t notice. So I looked it up. Turns out, oligofructose is extracted from fruits or vegetables- in this case from chicory root. 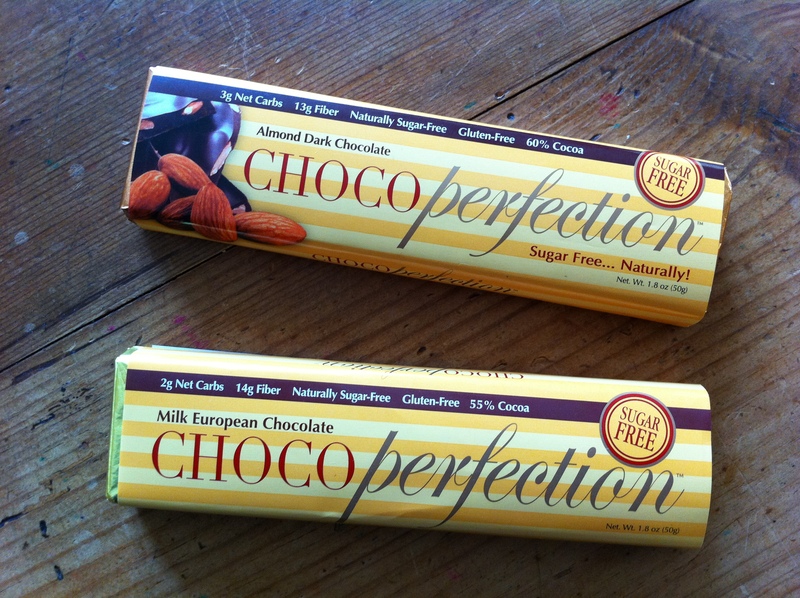 It is touted as being not only not bad, but in fact health promoting on account of the extremely high amount of dietary fiber (one Chocoperfection bar brings with it an astounding 52 % of recommended dietary fiber) as well as prebiotic effects- which is to say it is believed to stimulate the growth of “good” bacteria in the colon. Erythritol is a “sugar alcohol,” which doesn’t sound like a good thing. After all, sugar alcohols such as “xylitol” and “maltitol” are known to be associated with laxative properties and “gastric distress.” Ew! However, erythritol is unique; unlike other sugar alcohols it is absorbed in the small intestine and then excreted. Translation? No tummy troubles. Upshot: together, oligofructose and erythritol have a pretty good thing going. They supplement one another’s sweetness and counteract one another’s aftertaste. What’s the down side? Well, aside from making my digestive area a little gurgly and- ahem- wind-filled (heLLOO fiber!) the number one complaint would have to be it’s expense: one tiny 1.8 oz bar goes for between three and four dollars- that’s nearly a dollar a bite. But nutritionally? Well, let’s review: what are the complaints about sugar (fructose)? It gets metabolized as fatty acids. This, in turn, creates cardiovascular disease, fatty liver disease, stroke, insulin resistance/diabetes, not to mention promoting the growth of cancerous cells. Basically, every problem known to man except hemorrhoids and hammer toes. Well- from everything I can discern, oligofructose and erythritol don’t turn to fat in your bloodstream, don’t raise blood sugar levels and don’t even cause hammer toes. Instead, there is a boatload of fiber, which by definition means it isn’t even being processed until it gets to the colon, at which point it ferments into gases and… well, we’re back in the windy city, so to speak. Best of all? Drumroll please… the “chocolate” bar? Is pretty darn good. I mean, good. Well, at least the “Almond Dark Chocolate” is. “Milk Chocolate,” which we also tried, has a hard-to-place weird taste. (Other flavors offered that we did not try are “Dark” and “Dark Raspberry.”) You can’t buy these bars anywhere around here so, in the interest of pure, selfless, scientific research, we ordered a small box of almond dark chocolate bars and a small bag of granulated “sugar” (!!) to try in cooking. Unfortunately, the “sugar” doesn’t work as perfectly as one might hope- the texture is a little crunchy/dry/grainy in baked goods (we tried one batch of somewhat pasty peanut butter cookies), and there is a more distinct aftertaste than in the bars. Then again, maybe it’s not so unfortunate. Ever since we tried the “Chocoperfection” bars I’ve felt kinda… weird about the whole idea. Isn’t this cheating? I think. I wondered, is this an “artificial” sweetener because it isn’t sucrose/fructose, or is it a natural sweetener because it comes from chicory root? If the point is to avoid fructose, as well as artificial sweeteners that have known negative effects on the body, then we were doing that! If the point is to avoid extracted fructose, as well as any stuff that simulates fructose, then we weren’t doing that! Help! Hmm. Well, that’s essentially where I had ended up before: I don’t know. The thing I have to remember is that Dr. Lustig is a doctor and I’m a writer: he’s offering a doctor answer to what might be, for me, a writer question. Hmm again. I think I’m getting closer to an answer. Gillespie isn’t taking about oligofructose, per se, but as Lustig points out, all these new sweetening options are big question marks at this point. And question marks, Gillespie reminds us, don’t have a terrific track record when it comes to our bodies’ health. But back to ethics: it just still feels like cheating to me. Steve is a big “Chocoperfection” fan and much less conflicted about the whole thing than I am. His argument is that even with our “special” chocolate bars, spending a year avoiding all added sugar is still really, really hard. Which is true. And yet… don’t you just have to go with your gut, so to speak? So we slowly, s-l-o-w-l-y finished off the “special” chocolate bars and for the time being have decided not to order more. The bag of “sugar” languishes in the closet. Sigh. In regards to sugar vs. sweeteners, I have a little input that might be of interest. I used to suffer from severe pulsatile tinnitus in my right ear. According to a CT scan, there is a blood vessel much closer to my right ear than normal, and supposedly what I hear as ‘tinnitus’ is the blood flowing through that. However, when I starting low carbing and cut all sugars from my diet, about a week later it started to fade away and very soon was gone completely. And then the few times I slipped and ate something with a lot of sugar, it would come back, for a few hours or half a day. So I know sugar — or whatever sugar is doing to my blood flow — is the culprit. What’s interesting though is that most sweeteners have the same effect. If I eat something with a fair amount of sweetener in it, or drink a couple of diet sodas with sweetener, the tinnitus comes back, the same way it does with sugar. I’m no doctor, but to me, this says that the sweeteners are doing the same sort of thing to my blood that the sugar was — after all, what I’m hearing is my blood pulsing. So I listen to what my ear tells me regarding sweeteners! Interestingly, erythritol is one of the few ‘alternates’ that doesn’t cause it at all. Most of the sweeteners here with erythritol are a mix with something else (aspartame, acesulfame K, etc) and so will still set me off, but I have found one with is mostly erythritol with a bit of rakanka extract (it’s a fruit) and that doesn’t set me off. So I use that when I want to use sweetener. Still, all things considered, I try to avoid sweeteners almost as much as I avoid sugar. Thanks SO much for your encouragement- which is truly invaluable. Honestly, when I get a comment like yours it makes my day and everything seems a little easier. I really appreciate your comments in particular as someone who clearly has a long history of paying attention to the effects sugar has on your system… Even after learning everything I have learned I continue to be surprised at how much a difference sugar can make- and your tinnitus is a great example. Your experience supports the claims I found that erythritol is not like other sugar alcohols- which is one big vote in it’s favor. And your point on the fruit is a good one- I’d like to try some more experimenting and report back more- with recipes, that is if they’re worth anything! Thanks for your reply. I am in return delighted and humbled to hear that my encouragement means so much to you. I really am so glad that you took the time to post your link in comments of the Taubes article – I’d not have found you otherwise, and as I’ve said, you are an inspiration! That said, it also means, to me at least, that this is for life, not for just sometimes. The tinnitus had such a debilitating effect on my daily well-being that I know I will never go back to that. Of course, when I think about how happy I am without it, it’s also easier for me to avoid sugars. I’ve been trying a lot of sweeteners out of curiosity since I changed to the no-sugar diet; because I did have a hell of a sweet tooth, and I wanted to see if there was a viable alternative. Erythritol seems to be the only one I’m comfortable with, and the only one I’d feel okay recommending to other people. But there are still so many “mixes” out there — I’ve even tried several different things that are 98% erythritol, but as soon as the other 2% contain any kind of other artificial sweetener it sets me off. (As I mentioned before aspartame and acesulfame K, and also even sucralose seems to do it – stevia seemed okay but I’ve only had it as a sweetener in a bottled beverage, and I didn’t like the aftertaste.) Plant extracts such as the rakanka I mentioned seem okay, but that’s still with about 98% erythritol. If you have any sugar-free recipes that work, I for one would love to read them and try them myself! Even the banana/date ones you’ve mentioned. Since going low-carb I’ve rediscovered the pleasure of cooking, and in particular my childhood love of baking. I’m still sort of kitchen-newbie, though, so I’m not as comfortable with altering recipes by myself. I’d love to try yours! Sorry if I get wordy, by the way – sometimes once you get me talking it’s hard to get me to stop! And it’s very nice to be able to ‘talk’ to you. I am SO glad you wrote about erythritol. I have a jar of bbq sauce that I have indulged in once in a while since starting my no-sugar/less-sugar journey. It is called Grandma Koyote’s BBQ Sauce and on the label reads, “No Sugar Added” and “Diabetic Friendly”. I am happy to know I don’t have to feel quite so uncertain or guilty when I have some. I am still a little unsure about consuming things that have names that resemble pharmaceutical drugs (!) but maybe they are running out of natural sounding names for foods. Hmm?! Also, I have followed along with your recipes for sweets. I quickly got very burned out on bananas and now can only have them once or twice a week. I have taken more of a liking to dates. I have found so many LaraBar-like recipes and have loved experimenting with various flavors. My favorite so far is lemon. I find that it helps to attach dessert names to these treats to help keep my mind on the “idea” of the a luxurious dessert. For example, I have been eating tons of date balls consisting of dates, almonds and pecans. Those are “Pecan Pie”! The ones I make with carrot are “Carrot Cake”. The lemon ones are “Lemon Meringue”. Yum! So much better than thinking about eating a mouth full of dates and nuts. Your mind can take you to another place if you let it! It keeps it fun too! My next step is to seek out recipes that use mashed up apple, or homemade applesauce as a sweetener. If I come up with anything decent I will let you know. Please do share if you come up with some recipes you really like- I would love to give them a whirl. Meanwhile, David Gillespie writes in Sweet Poison about sweetening with dextrose (glucose) powder, so that’s next on my list of experiments- stay tuned! so if you find ways to eat MORE fruit isn’t that defeating the purpose of going low sugar? baking with fruit is still eating fructose, but making it less healthy by heating it. David Gillespie and Robert Lustig make it clear that after a few pieces of fruit a day (2 or 3?) that’s all your body needs. The whole baking sweet treats…more than a few special times a year at least…seems like a bad idea. I know it spoils the sweet-baking-pleasure thing, but what about baking savory or bread or cooking better complete meals for the cooking-for-your-loved-ones-caring/nuturing instinct we value? If you keep craving sweet treats maybe you haven’t actually withdrawn from sweetness yet. Just a thought. But your point is a good one- if we are eating TONS of fruit- more than a few pieces per day, that would qualify as too much fructose too. So far I havent kept track, but I think I will informally start and see where we’re at. Great post Eve (and I’m not just saying that cos you quoted me … ). I’m not a big fan of oligofructans (inulin, chicory root extract etc) because my read of the biochem is that they achieve the same result as fructose (bypass appetite control and end their journey in our bloodstream as fat). Wow!! Sorry I didn’t respond sooner- I was busy picking myself up off the floor! Very excited to have your input and, as you can see in my most recent post, your book has made a huge impression. Your comment makes me feel that my instinct on oligofructans is correct- not an ideal way to go. I am looking forward to trying some of the dextrose recipes on your site, as soon as I can locate a place to buy it. Think I may have to resort to mail order. Small price to pay to be able to enjoy Frank’s Strawberry Ricotta Cake! You are currently reading A Year Of No Sugar: Post 46 at Eve O. Schaub.